Ceramic Fiber Insulation Blanket Wool High 2400F Thermal Ceramics 10mm x 12"x24"
2 Pcs of Ceramic Fiber Blanket 2300F 8# High Temp Thermal Insulation 2"x12"x12"
2 pcs of 1" Ceramic Fiber Insulation Blanket 2600F 8# 12" X 24"
iyaknowsbest has no other items for sale. 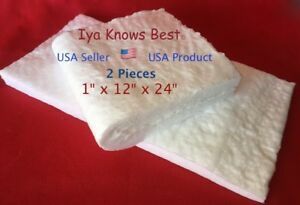 2300° Kaowool KAWL Paper 1/16"
2300° Kaowool KAWL Paper 1/8"
2300° Kaowool thin Blanket ½ "
Very fast shipping, haven't used it yet. Great seller though.